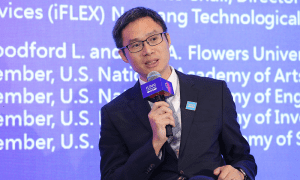 In spite of wanting to become a professional soccer player as a child, Zhiyong Tang’s career path has followed quite a different route, ultimately leading him to his current position as a professor at the National Center for Nanoscience and Technology in Beijing, China. Together with his research team, Prof. Tang investigates the controllable synthesis and assembly, property manipulation, and practical applications of inorganic nanomaterials, including metal–organic frameworks. During his Bachelor and Masters degrees at Wuhan University, Zhiyong’s passion for science began to grow, leading him to the Changchun Institute of Applied Chemistry, where he obtained a PhD in the group Prof. Erkang Wang. Following a stay at the Swiss Federal Institute of Technology in Zurich as a research associate, Tang pursued a research fellowship at the Oklahoma State University, and later at the University of Michigan in the group of Prof. Nicholas Kotov. His experiences in the groups of both Prof. Erkang Wang and Prof. Nicholas Kotov were some of the most influential on his career and significantly influenced his current way of thinking. But spending some incredible years in the US, which he remembers fondly, faced Zhiyong with one of the most difficult decisions of his life: Should he accept one of the multiple faculty appointments offered to him back home in China, as well as overseas, or remain in the US? He ultimately chose to return to China – a choice which has clearly proven to be a worthwhile career move, considering his fantastic research achievements in the field of inorganic nanomaterials. But Prof. Tang is not only interested in this field. On discussing science in general, Zhiyong is enthusiastic about the future of 3D printing and precision medicine, and looks forward to witnessing the many discoveries and achievements that he hopes both fields will make. Additionally, he believes that advances in artificial intelligence technology will save researchers a lot of time and effort, as compared to common trial-and-error methods used currently in the lab. Looking further into the future, Tang expects that chiral nanomaterials will become one of the hottest topics in science, and is waiting in anticipation for the day when the origin of chirality in nature is discovered. Ending on a more philosophical note, Zhiyong Tang would like to share some of that best advice that he has ever been given with his younger colleagues starting out in the field: work hard and be smart in selecting the right research projects to distinguish yourself from others. Yet, his biggest motivation has always been to enjoy life with his family – and to have fun while drinking Chinese wine with his friends! To find out more about Zhiyong Tang’s line of research, please check out his recent Review on “Metal–Organic Frameworks Encapsulating Active Nanoparticles as Emerging Composites for Catalysis: Recent Progress and Perspectives” in the Advanced Materials Hall of Fame virtual issue.